This year I noticed these little blighters on some of our roses, which led to my investigation of them. They seemed to choose the white roses and were not evident on any of the darker colours. 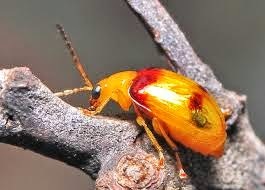 Warm dry weather will encourage the small (around 6mm) native Monolepta Beetle to take up residence in our gardens. As their common name suggests, these little yellow beetles have a red stripe across their shoulders and a red spot on their wings. Also called red-shouldered leaf beetle, this native beetle occurs in northern and eastern Australia with tropical and subtropical climates. These beetles can appear in enormous swarms, especially during warmer dry months, shredding leaves and stripping flowers. These beetles will attack avocado, citrus, mango and strawberry, corn and cucurbits, and natives such as eucalypt, tea-tree and wattle. The larvae are white grubs that feed underground. The only way to protect your garden from attack is to keep shrubs watered well during dry spells and keep the garden surface mulched to prevent moisture loss through evaporation. This year we didn't mulch the roses so we've learnt a very valuable lesson! If the plant being attacked is not too large, using a stick knock them into a container of soapy water. Spraying is not really an option because sprays that kill these beetles will also kill beneficial insects visiting plants at the same time. You could try putting a white container with water in it near the infested shrub and some will drown - DO NOT put soap in this as you'll do the bees in. There are no known predators that are effective against high populations of Monolepta australis. I have the red shouldered leaf beetle in absolute plague proportions and they have almost stripped my very large white crepe myrtle tree. Is there anything I can do to save my lovely tree? I'm sorry that I haven't a definite answer for you - hopefully someone else will see your request and have a solution for you.